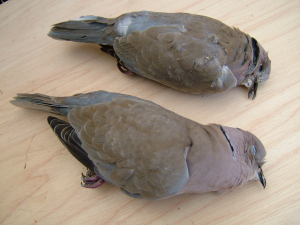 Collared Dove deaths, is there anything more to it? 10 Days ago I found a Collared Dove dead on the ground apparently untouched by cat (I acknowledge it could have been killed and left?). It appeared to have sat on the ground underneath its roosting tree and died. This morning i found another apparently untouched dead collared Dove sat on the ground under its roosting tree. I also have a third Collared Dove who keeps sitting on the ground in the garden in the middle of the afternoon and settling down to sleep, it is not having a dust or ant bath. It seems to have a distended croup (fat neck), but if i approach it, it flies off fine. The 2 dead doves don't appear to have a fat neck. There have been a family of Collared Doves in my garden since i moved in 7 years ago. Is this something to be worried about, poisoning or disease? Or is it nothing but nature. Has anyone else noticed anything similar?